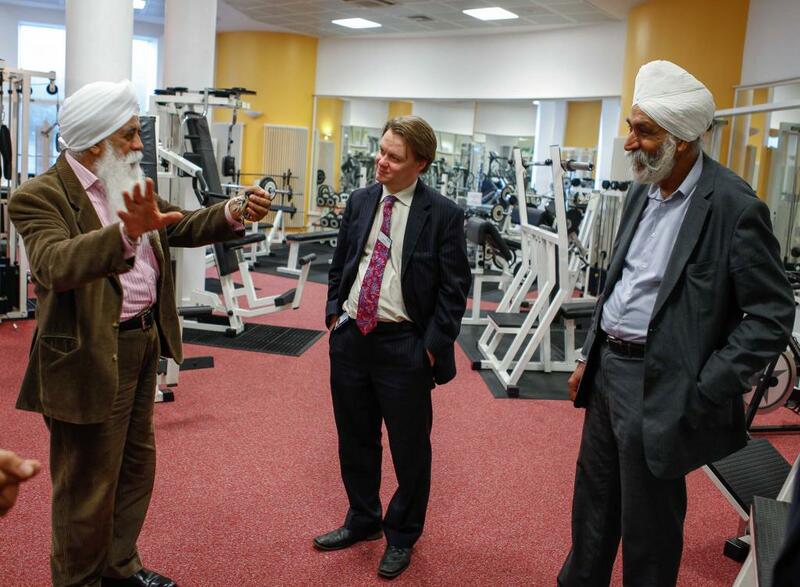 Newly appointed CEO of Sandwell and West Birmingham Hospitals NHS Trust, Toby Lewis, along with Chairman, Richard Samuda and Non-Executive Director, Dr Sarindar Singh Sahota visited Guru Nanak Nishkam Sewak Jatha (GNNSJ) and the Nishkam Centre as part of their wider strategy to work with local community organisations to improve health and wellbeing across all communities. Discussions took place to scope a more resilient health model that empowers patients with shared values for the common good. 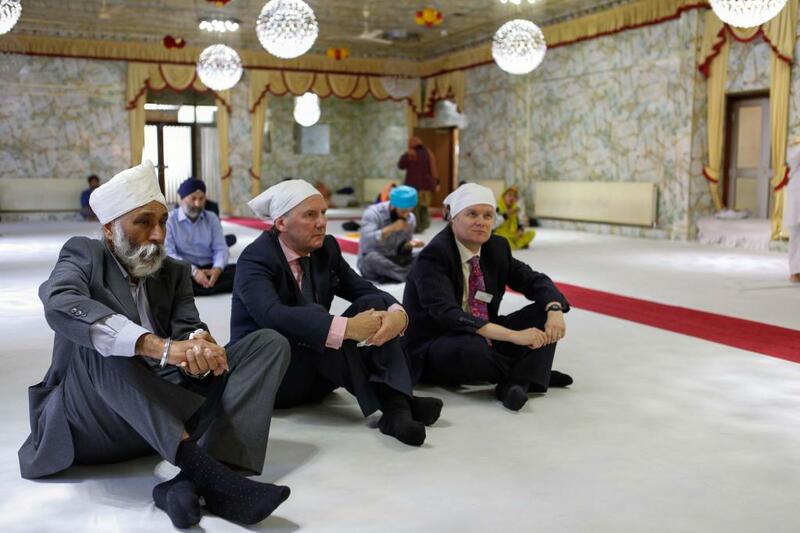 The visit included a tour of Nishkam’s five centres for excellence, which began at the Gurudwara, where everyone paid their respects to Guru Granth Sahib Ji, the eternal Guru of the Sikhs. This was then followed by a visit to the roof-top Guru Darbar (Guru’s court), where the visitors marvelled at its unique internal architecture and the hand crafted breath-taking mirror work done by a muslim craftsman. 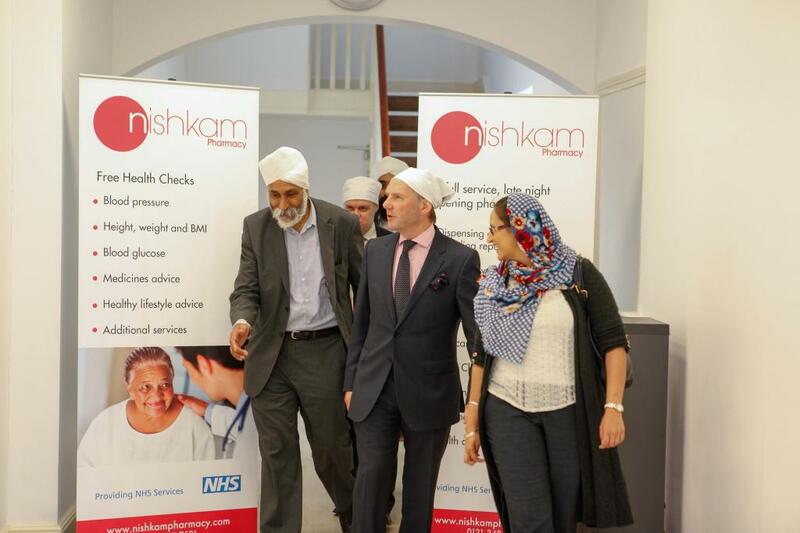 The esteemed guests visited the Nishkam Pharmacy which is managed through voluntary efforts of healthcare professionals and members of the community. Following this they made their way to the Nishkam Centre to understand what each organisation could do to assist the other and identify opportunities for collaboration. The discussion explored the strength of faith / community organisations, the vast social / spiritual capital and the volunteering element that clearly existed and how this could be dovetailed with service needs to improve patient services and choice. The meeting included discussions to identify ways organisational strengths could be utilised to serve the local and global community, whilst reflecting on the progress GNNSJ and NCA had made in creating interfaith harmony and community cohesion. Bhai Sahib added: “Collaboration and partnership is crucial; we must work together innovatively and excel. Partnerships are recognised as the way forward and are one of the eight Millennium Development Goals. It is paramount that we are also frugal whilst being innovative and creative to improve service provision in a culturally sensitive way. We must utilise values in all that we think and do, which is why we created the Nishkam Schools to impart values to children that will enable them to become good citizens and professionals”. In addition to community empowerment, Toby Lewis discussed his vision to enhance the values and personal accountability within NHS staff. He was keen to share that becoming a force for the ‘greater good’ is what attracts many in the NHS to serve patients in the first place. He also shared his vision to reviving these values which would bring about the change healthcare seeks right now. Chief Executive of SWBH NHS Trust, Toby Lewis said: “Our organisation delivers high quality community and acute healthcare. Yet we have a great deal to learn from partners such as Nishkam about how we create sustainable help for people in their own home that joins up the range of care needs that individuals and families have. “We have discussed a variety of collaborations for the coming months and look forward to confirming which have the greatest merit once we have had chance to review the public health needs that our own clinicians and those from the Nishkam health team have collated. Before departing the guests enjoyed Langar (blessed vegetarian meal from the Guru’s kitchen) and were amazed to learn that over one million free meals are prepared and served by volunteers to visitors every year. There was a sense of excitement that the discussion will strengthen partnerships and formulate a collaborated wider strategy to improve the health and wellbeing of the people living in Sandwell, West Birmingham and beyond.